Would you live with construction workers in your house for 24 hours/7 days a week for 38 years? It would be enough to drive anyone mad. 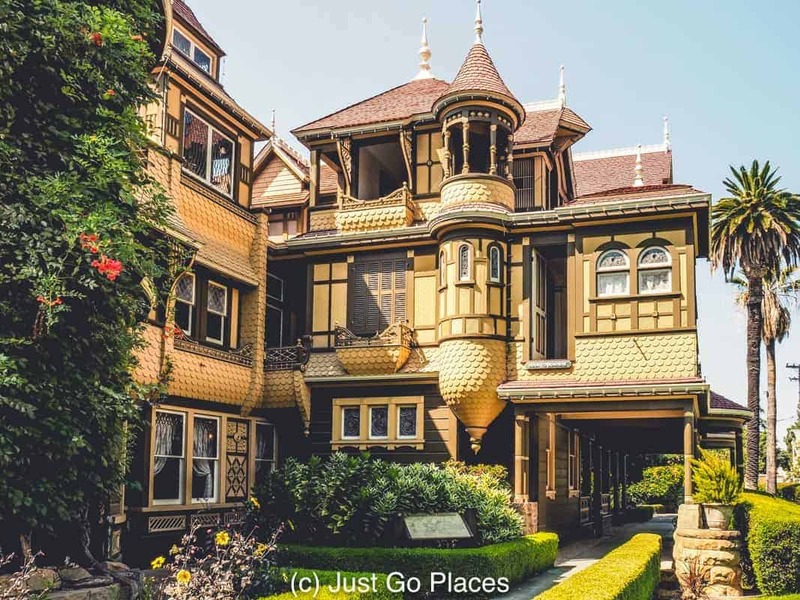 Supposedly that is what Sarah Winchester did when she built the Winchester Mystery House in San Jose, California at the turn of the 20th century. No one knows why she built this strange rambling house with random staircases that lead to dead ends, doors that opened onto a 2 floor drop and pillars placed upside-down. In addition, there was a tragic backstory, a reclusive woman and details that were lost in the mists of time. 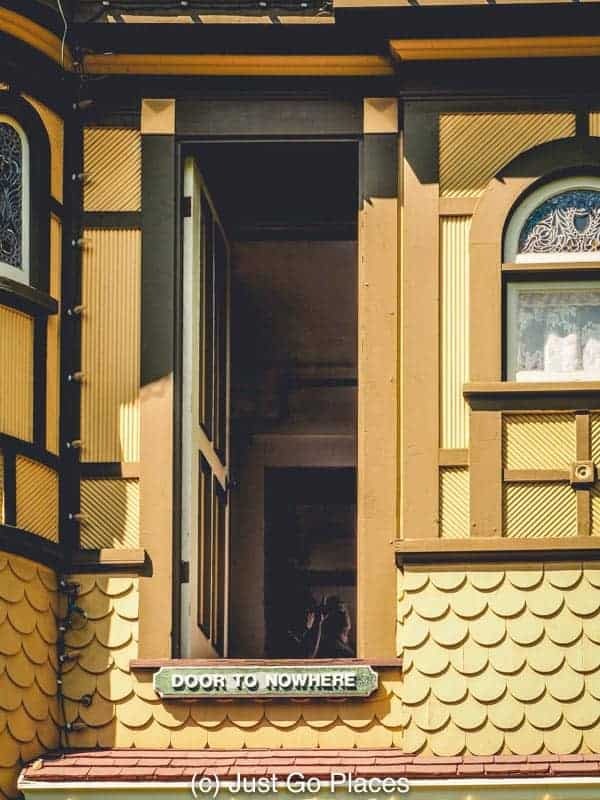 After Sarah Winchester’s death, it was pretty easy to sell the house as a tourist attraction because the whole thing really was just odd. 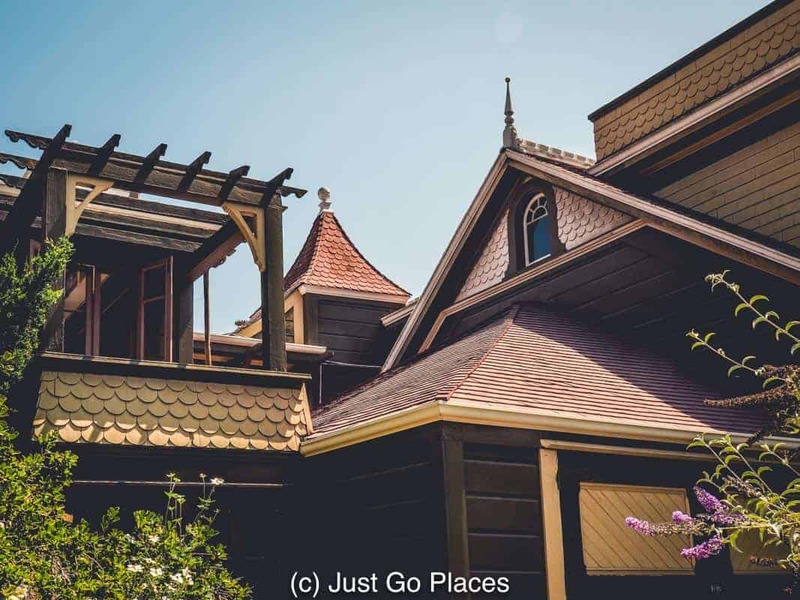 When we left San Francisco, on our road trip down the Pacific Coast Highway, we thought we would do a quick detour and see the famed Winchester Mystery House. Although the house did not disappoint, neither did it provide thrills and chills. The Winchester Mystery House is most mysterious for holding close the secrets of its former owner, Sarah Winchester. 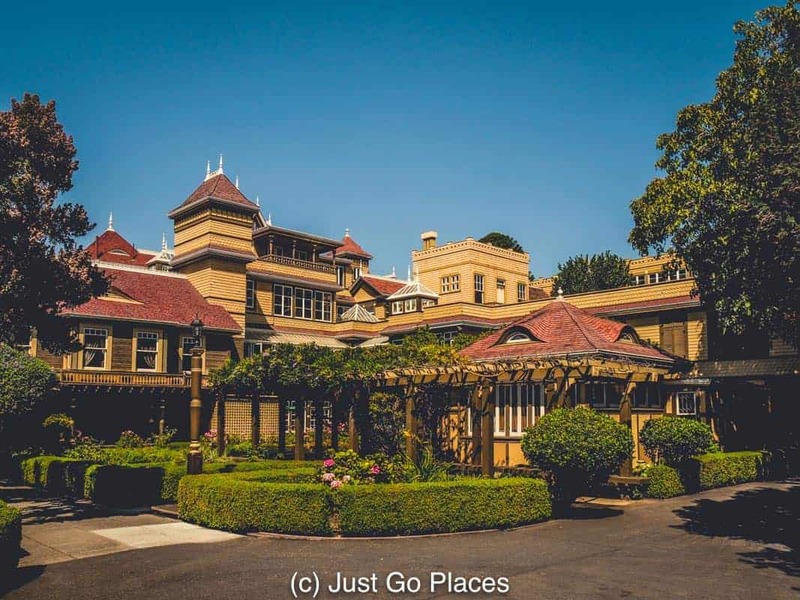 2 Is the Winchester Mystery House Haunted? 6 Join our growing community of readers! Sarah Winchester, the architect of the Winchester Mystery House, was a remarkable woman. Born in New Haven as Sarah Pardee she was noted for her beauty and her intelligence. She spoke 5 languages and was an accomplished musician and classicist. She married William Wirt Winchester who was the son of the man who invented the Winchester rifle. 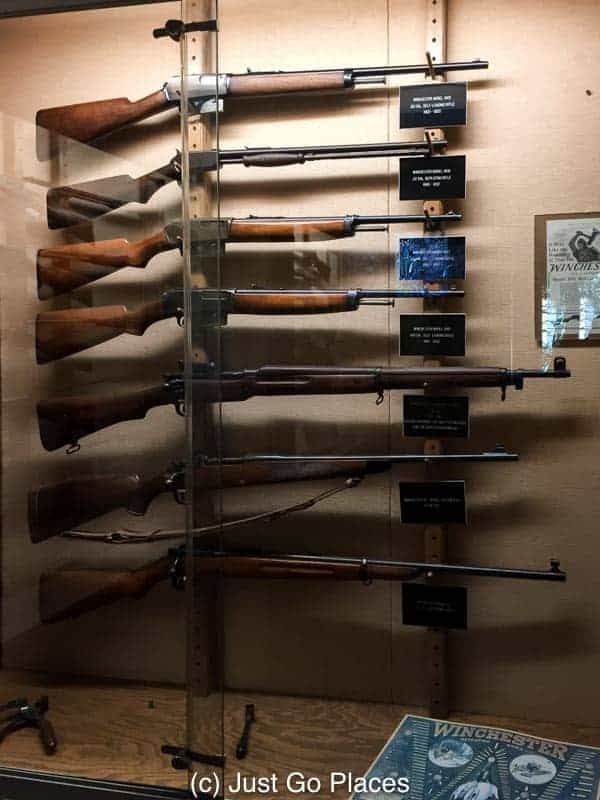 Some of the models of the Winchester rifles. The Winchester Repeating Arms Company was the most successful gun company in the 19th century. The Winchester rifle could fire 15 shots in just over 10 seconds. It became known as the ‘gun that won the West’ and was an American success story. 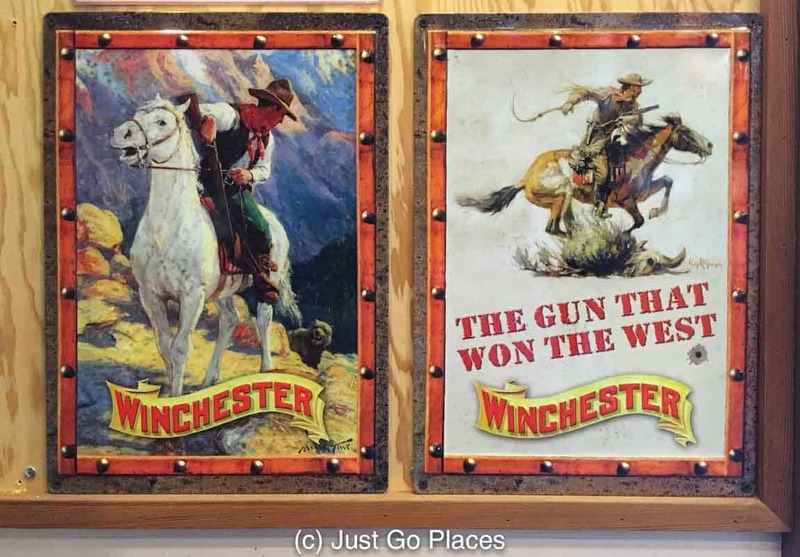 Advertisements for the Winchester Rifles which played a major part in US history. The couple were happy, young socialites living a charmed life in New England. Unfortunately, they lost an infant daughter to a rare disease in 1886. When William died in 1881 at the age of 43, Sarah was devastated. 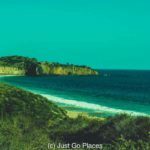 She traveled the world for 3 years and then eventually settled in California where she had relatives from the Pardee side of her family. Upon William’s death, Sarah inherited $20 million dollars in cash and shares in the Winchester Repeating Arms Company. She had about a $1000 a day to spend as she wished. She choose to spend it on her house. Even in today’s money, Sarah’s inheritance would be considered a nice chunk of change but back in the late 19th century, it made her an enormously wealthy woman. 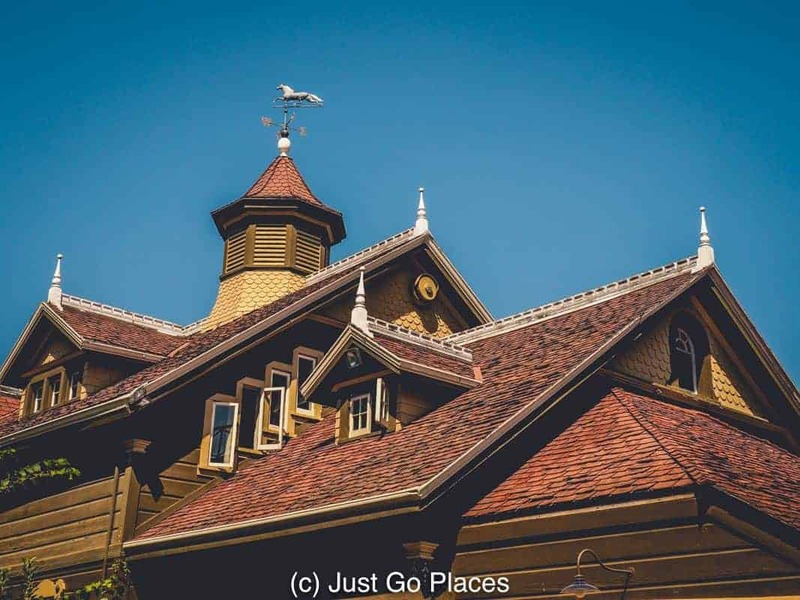 Is the Winchester Mystery House Haunted? According to the legend, when Sarah was living on the East Coast, she consulted a famous medium who told her that she was a victim of the blood money of her inheritance. All those Native Americans, civil war soldiers, outlaws, sheriffs etc who had been killed using the Winchester rifles did not go gently into that good night. No, they were out to get her. Walk through this door at your peril. The only way for her to to appease the spirits that haunted her was to undertake living in a never-ending construction site. Clearly these ghosts were pretty spiteful. Having lived through a house undergoing refurbishment, it is not a fate I would wish on anyone. The construction foreman had a house on-site. I wondered why Sarah Winchester would not have just given away her inheritance to charity. Without the money, the spirits had no reason to haunt her. She neither got rid of her shares in the evil Winchester money nor the money that came from it. The Pardee side of the family were wealthy in their own right so it wasn’t like she was going to be poor if she got rid of the Winchester money. In any event, Sarah Winchester died in 1922 at the ripe old age of 82. Clearly she had done a good job of outrunning malevolent spirits. She left all the furniture in the house to her niece who put it up for auction. Without a 160 room mansion, the furniture contained within those 160 rooms would be a little hard to store! In 1923, the house itself was sold at auction and eventually wound up in the hands of a John Brown who saw the possibilities in opening it up as a tourist attraction. John Brown had a history of working in carnivals and he knew how to sell a good story. You can visit 110 of the 160 rooms in the house. The Mystery House designation was given to the house in a newspaper article after a visit by famed illusionist, Harry Houdini. 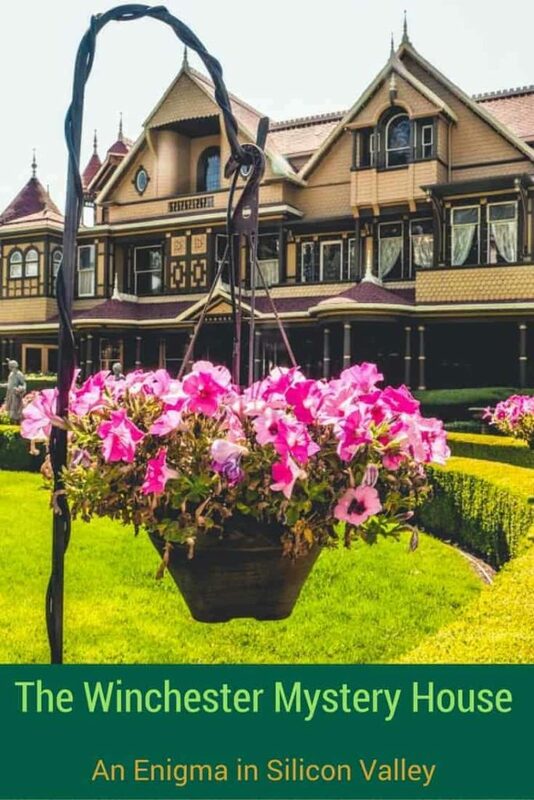 If you want to read an alternative theory about Sarah Winchester, the book Captive of the Labyrinth by historian Mary Ignoffo puts forth the theory that Sarah just wanted to be a visionary architect. 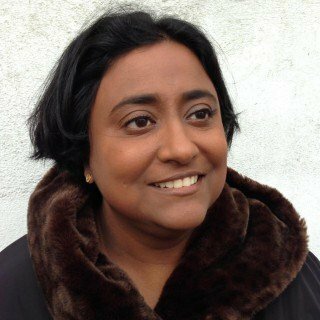 She was fascinated with the English Renaissance philosopher, Francis Bacon, Freemasonic concepts of encryption and mathematics. She wanted to build a house that was a puzzle similar to Rosslyn Chapel which figured so heavily in Freemason thought (according to Dan Brown’s The Da Vinci Code). Unfortunately, Sarah was born a woman in a time when women weren’t allowed to be architects and so everyone just thought she was a little crazy. So, there you have it… a choice between a haunted house or a Masonic conspiracy. Unfortunately no photographs were allowed of the inside of the house. 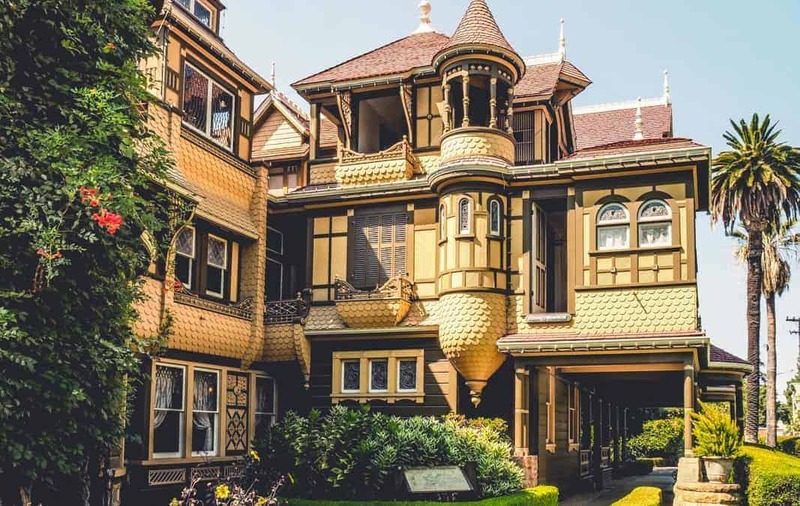 Here are some random facts about the Winchester Mystery House that are interesting. When Mrs. Winchester bought the house it was an 8 room farmhouse set on 161 acres. There have been so many addition and changes to the farmhouse that its now hard to know where the original house rooms would have stood. 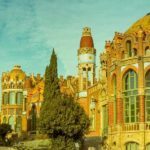 The house has 10,000 window panes, 467 doorways, 160 rooms, 52 skylights, 47 fireplaces, 40 bedrooms, 40 staircases, 17 chimneys, 6 kitchens, 3 elevators, 13 bathrooms, 2 mirrors and 1 shower. 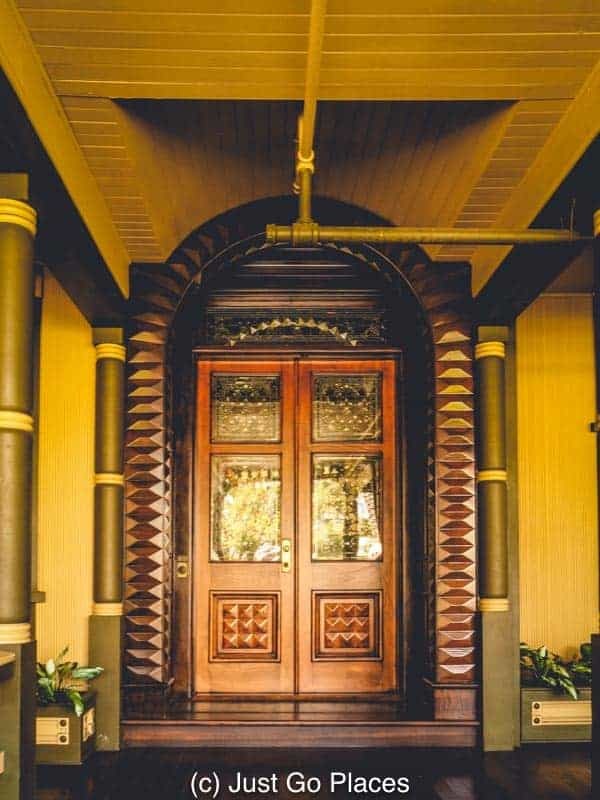 It is said that only 2 people have passed through this elegant front door – Sarah Winchester and the man who installed it. By 1906, the mansion was spread out over 7 floors. After the earthquake collapsed the top 3 floors, Mrs. Winchester kept it as a 4 floor house. Mrs. Winchester slept in a different bedroom every night supposedly so the spirits couldn’t find her. Well, unfortunately, after the 1906 San Francisco earthquake, the servants couldn’t find her either. The elaborate facade with windows … and a 2nd floor door. Mrs. Winchester was a generous woman to her staff. Many stayed with her for years. She employed 18 house servants, 13 carpenters 8-10 gardeners and 2 chauffeurs. The house is a mishmash of architectural styles but mostly Victorian. Having been constructed over 38 years, architectural styles and fashion would have changed. 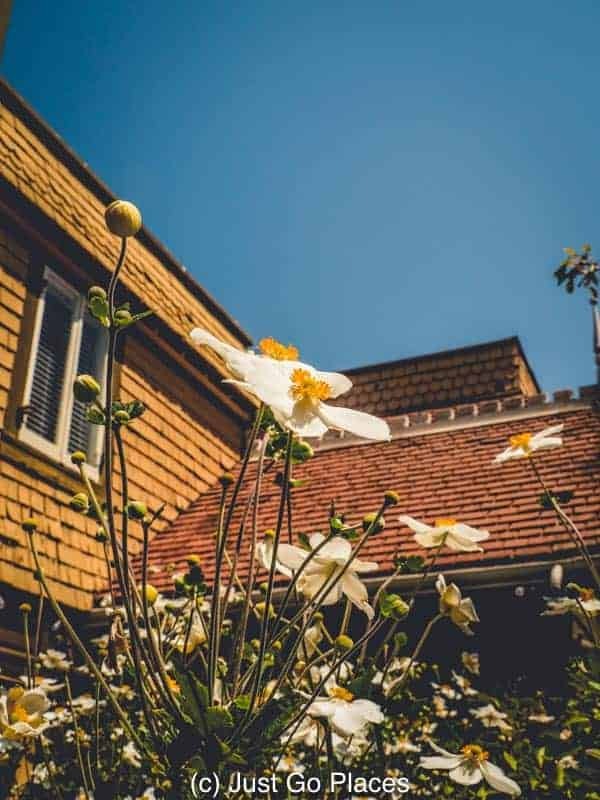 The house is surrounded by gardens which would have been more extensive in Sarah Winchester’s day. On the plus side, she kept a lot of people employed. turrets and clashing windows … why not? She liked daisies because they have 13 petals. The number 13 is important to Freemason and occult mythology. 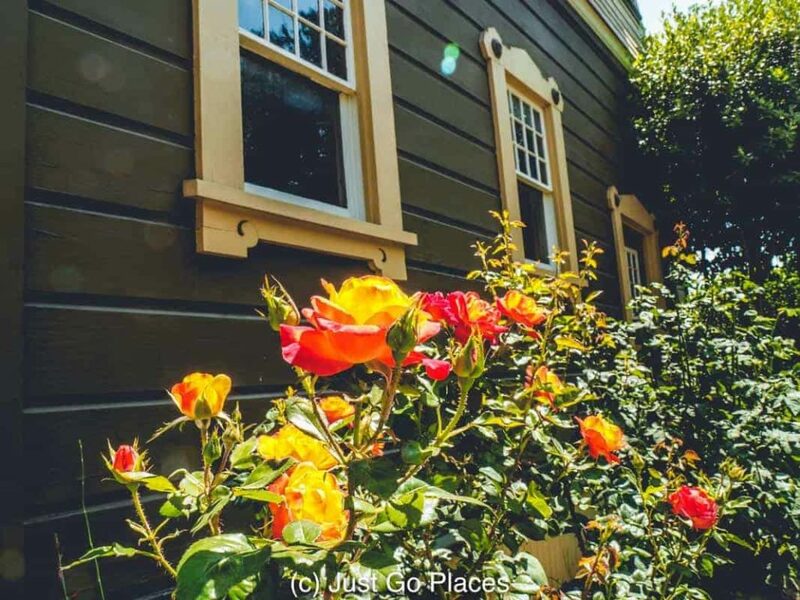 There are regular tours that take you through the Winchester Mystery House. Our tour group had about 20 people of which 5 were children. There is nothing particularly scary in the house. The kids thought it was more wacky and fun than scary. Like a giant fun house at a fun fair but without the plastic ghosts jumping out at you. So, I guess in that respect the Browns were right on the money. 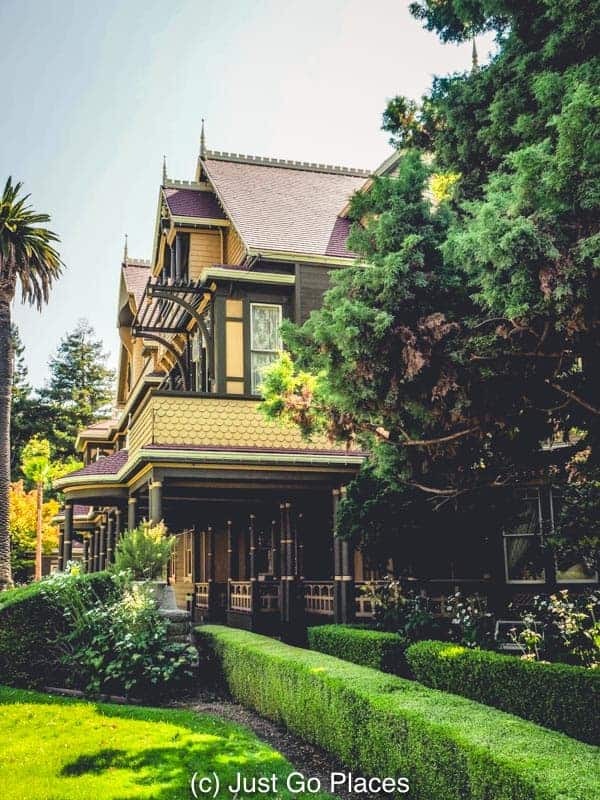 The Winchester Mystery House in San Jose is a major tourist attraction in the area. You have a choice of a tour of the house (1 hour) or the house and gardens (2 hours). We choose the tour of the house which seemed just the right amount of time for our family. You don’t visit all of the house but more parts of the house are now included in the tour than ever before. The gardens are pretty enough to wander around on your own. There is a cafe on site and a giant gift shop. For Halloween, they have candlelight tours of the house. 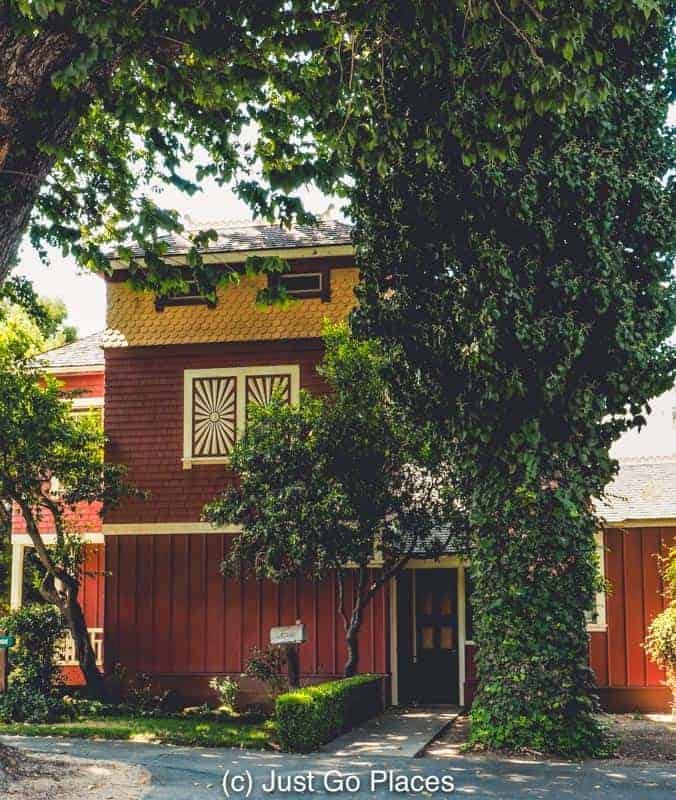 The Winchester Mystery House is listed on the National Registry of Historic Places. It is a privately owned enterprise which is still be owned by descendants of the Browns. This post is linked up with City Tripping. All of the times I have been in that area over the decades, I have never stopped in. Maybe, next time? It’d definitely worth a look! I’m inclined to believe she’s a Mason and the whole thing is a code waiting to be broken. Way more interesting than just ghosts. What an interesting story! And such an incredible house, very unique in its style and history! I wish I can visit it one day! thank you for sharing! I hope you do get to visit. It’s one of a kind. I love AHS. Season 1 had the haunted house didn’t it? 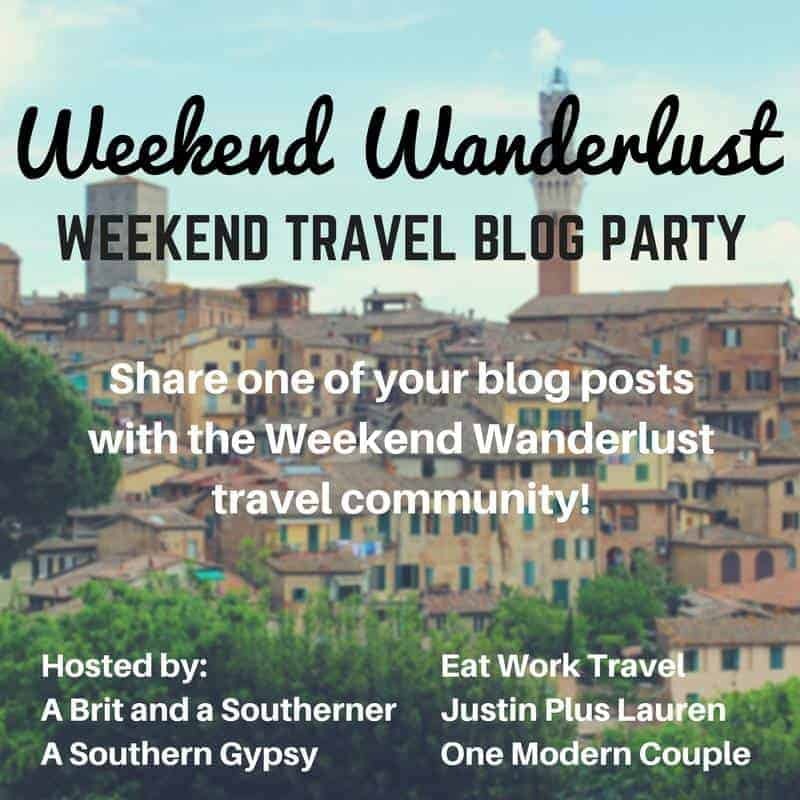 Bell recently posted…Publish Your Wanderlust Marriage Travel Story! 18 house servants? That’s crazy! I can’t imagine having so many people looking after my house! This looks absolutly crazy. Just the place I would have loved as a kid. We used to built crazy houses with lego and invent trap mechanisms and so… lol but this is the real thing! 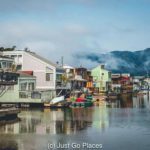 I hope you have a chance to visit next time you are in the area! It’s not really scary. They don’t turn it into a haunted house with dark rooms and cobwebs etc. The guides use more the power of insinuation because really no one has a clue why she did what she did. This sounds like a super interesting place. 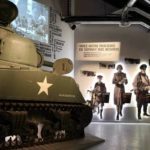 It’s fascinating to find out how places like this were created and although I wouldn’t want to have ever lived there while it was under construction, a visit looks well worth while to discover the history behind the house! It’s pretty cool isn’t it? 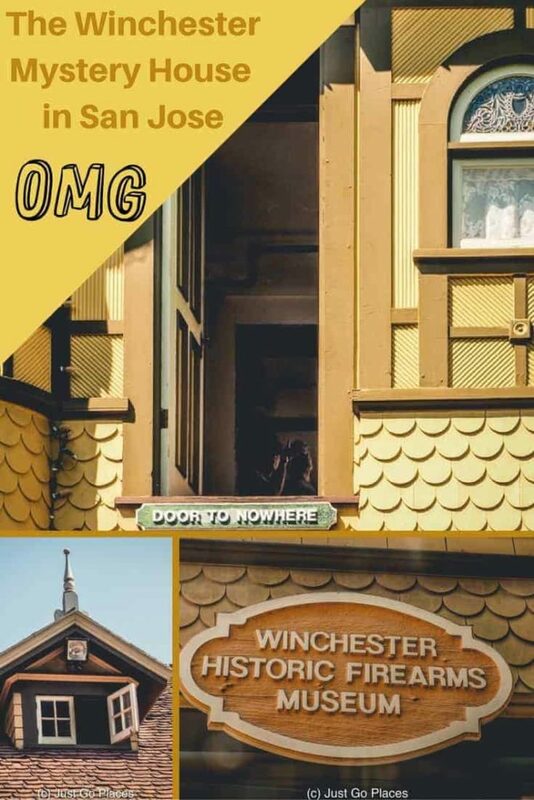 Mrs Winchester’s house achieved almost as much fame as her family’s guns. Good point. she didn’t write letters etc which is what rich women did I those days. We’re headed to the Winchester Manson from Riverside Ca. We’ve never been there and by 3;00 we will be there for the first time so I will let you all know our thoughts on the very interesting house. 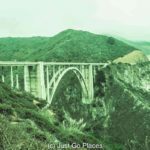 Then we’re headed to the California Redwoods witch we’ve been many times and my memories and my God keeps calling be back because of the splendor and beauty of these magnificent trees. If you’ve not seen these trees then you are missing one of the wonders of our world. That’s all I’m going to say because It’s just something you have to witness for your self.. We have been married for 52 years and finding that all of a sudden we are facing the other side of life and just want to enjoy all that we can while we can, sense there are no guarantees in life it’s self, if you know what I mean.May God Bless you in life as we have been, pleasant Journeys.!!! Hope you enjoy it! The Redwoods are cool too. So majestic. 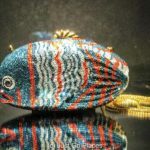 Robert recently posted…Why You Should Visit Los Haitises National Park in the Dominican Republic Now! Lucky you! I don’t know when I’ll be able to see more of the house!